New potatoes and hot smoked salmon are a great combination. Try them with the veg below, or any others you like. 1. In a pan, boil the potatoes for 20 minutes. Drain; set aside to cool. Refill the pan with water and bring back to the boil. Add the beans, asparagus and peas; simmer for 1 minute. Drain, refresh under cold water and pat dry with kitchen paper. 2. In a bowl, toss the veg with the salmon, tomatoes, cucumber and leaves. Mix the dressing ingredients together in another bowl and season. (Stir in 1-2 tsp whole milk to loosen, if needed.) Fold the dressing through the salad, garnish with a little more dill and serve. 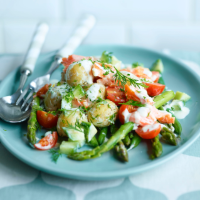 This recipe by Bronte Aurell of London’s Scandinavian Kitchen first appeared in Waitrose Kitchen magazine, April 2015. myWaitrose members can download the Waitrose Kitchen app edition for FREE. Find out more. This recipe was first published in Wed Apr 01 16:30:22 BST 2015.